Get ready to cruise like a king aboard Carnival Victory. 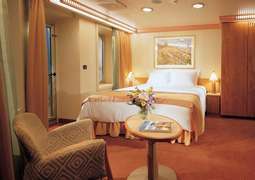 You will feel right at home in Carnival Victory's spacious staterooms, with its outstanding service and onboard elegant dining options. Carnival Victory offers a great range of entertainment activities for all ages, including the Camp Carnival program for kids, a bustling casino, impressive spa treatments, miniature golf, a jogging track and the Seaside Theatre. 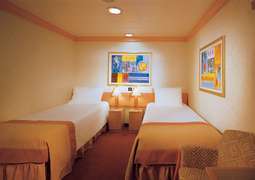 The delectable cuisine, myriad of entertainment options, modern and appealing interior make the Carnival Victory an ultimate vacation destination in itself. Whether you want to just unwind and soak up some sun, or party hard, Carnival Victory is perfect for you! On the Carnival Cruise Line, your stateroom is your home away from home. Whether you choose to stay in a simple Interior or Ocean View room, or are thinking about a more spacious Balcony or Suite, you'll be able to unwind in style after a day full of fun activities. 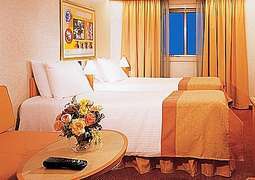 All staterooms offer 24-hour room service and private bathrooms, Comfort Collection linens and a personal attendant. A Grand Suite provides you an unparalleled experience that includes VIP check-in, an oversized balcony, and a dressing area with vanity. Culinary delights wait to satisfy your cravings on board Carnival Victory. Whether you’re looking for specialty or casual dining options, you’ll have plenty of choices on a Carnival Cruise Lines vacation. From classic Italian to Asian cuisine, the Carnival Victory caters to all tastes. A wide range of fine dining options including the Cucina Del Capitano and the Guy’s Burger Joint provide gastronomical delight for all palates, with specialty restaurants such as Blue Iguana Cantina and Bonsai Sushi, which offers an unforgettable fine dining experience. The entertainment on Carnival Victory is among the best in the business. Head over to South China Sea Casino to try your luck at poker, blackjack, or craps. Teens will love the recreational opportunities at these youth-only spaces such as Circle C, Camp Ocean or Club O2. Carnival Cruise Lines vacations are filled with a plethora of adrenaline-pumping activities onboard such as Carnival Waterworks, for those who love to get wet and wild, SportSquare to test your strength and courage, and plenty of bars and lounges like Caribbean Lounge or Piano Bar to de-stress. Find tranquility at the Serenity Adult Retreat and enjoy rejuvenating spa treatments at Cloud 9 Spa. The dress code aboard the Carnival Victory ranges from casual to chic. The evening dress code is typically casual. On cruise casual nights, men may dress in khakis, jeans, sport slacks, and a nice shirt. Women can wear casual dresses, pants and blouses, Capri pants, summer dresses, shorts and jeans. On elegant nights the dress code is formal, which means guest can wear tuxedos or evening gowns.